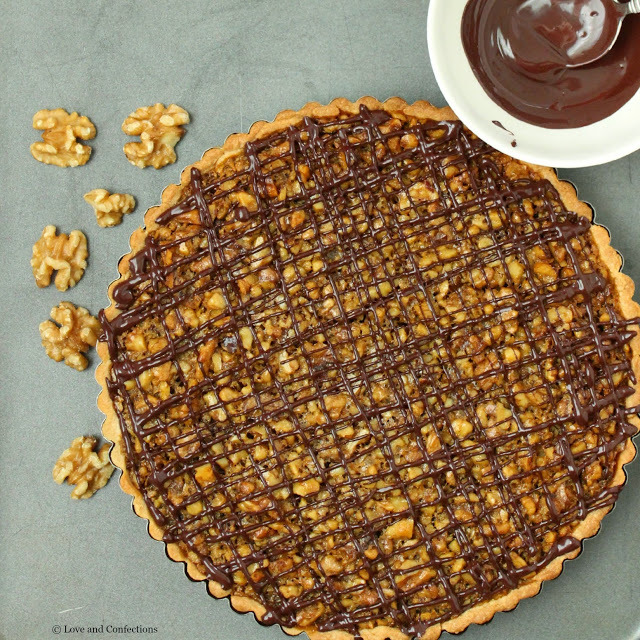 A perfectly sweet and crunchy tart with just the right amount of chocolate on top – this Whiskey Walnut Tart should definitely make an appearance at your next Brunch! Welcome to day 2 of #BrunchWeek hosted by myself and Shaina from Take A Bite Out Of Boca. I hope you enjoyed my Blueberry Sangria from yesterday. With 30 bloggers and over 120 recipes shared this week, we have something for everyone – plus a huge #BrunchWeek giveaway. 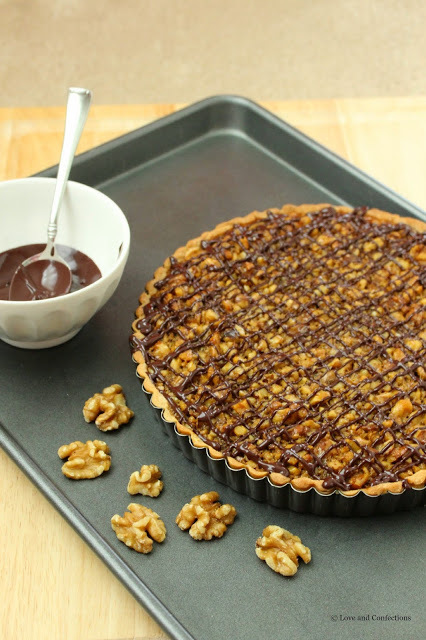 I decided to continue the adult beverage theme into today’s recipe – Whiskey Walnut Tart. This tart is kind of like a pecan pie, but kicked up a notch. 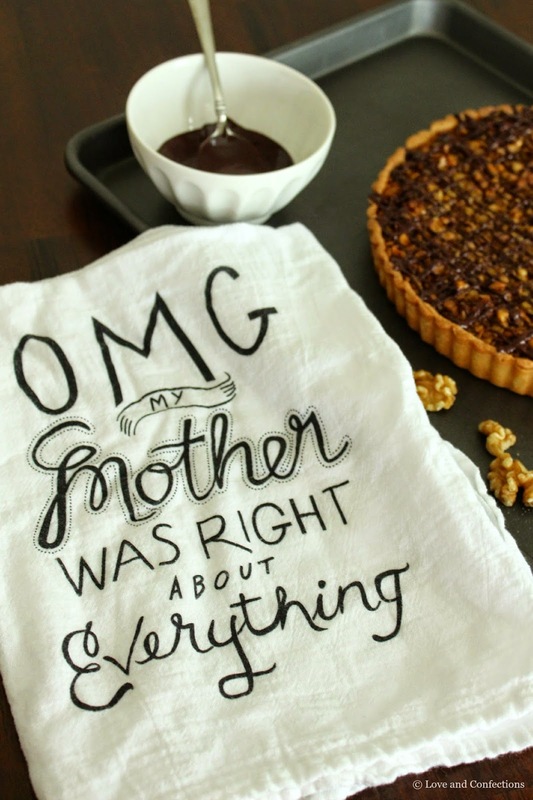 While I do love pecan pies, sometimes they are a bit too much. My Whiskey Walnut Tart is chock full of nuts with a chewy molasses and brown sugar filling. It is the perfect ratio of crust to filling, and adding bourbon to a dessert is always good in my book! 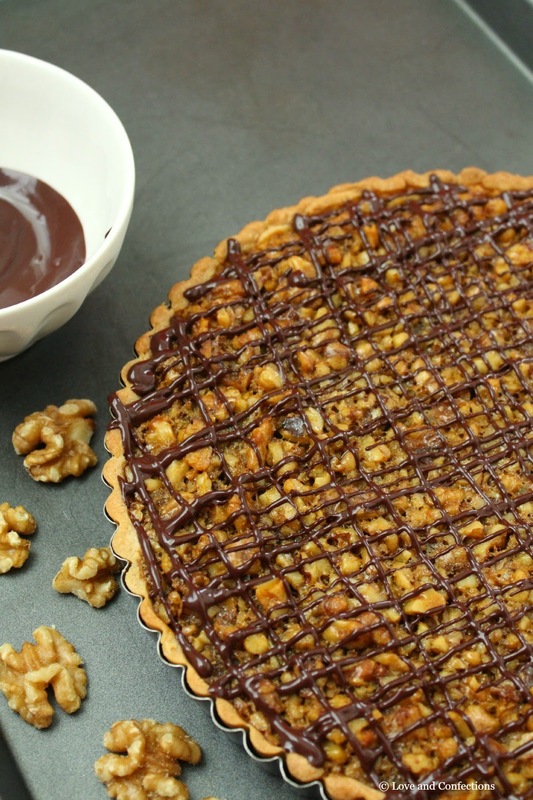 Plus, it is topped off with a drizzle of chocolate – booze and chocolate are dessert perfection! Even though I added Bourbon to my tart, you are more than welcome to omit the Whiskey if you choose. After baking, the Whiskey flavor is still very present but most of the alcohol has burned off. I actually added an extra dose of Bourbon in a Vanilla Bean Bourbon Whipped Cream that I will be sharing next week! One of my favorite types of pastries are tarts. You can have so many different flavor combinations – chocolate, nuts, fruit, lemon, etc. I also love miniature tarts because they are great for gatherings and buffets. This Whiskey Walnut Tart dough and filling can be used for mini tarts as well, and all you would need to do is adjust the baking time accordingly. This tart comes together very easily. I always use my KitchenAid Stand Mixer to make the dough. I usually make a full batch and freeze whatever I do not use. The dough lasts about 1 month in the freezer if properly stored and wrapped tight. Mixing the filling is extremely easy as well. Just add your ingredients to a bowl and mix together using Le Creuset’s newest Revolution Bimaterial Saute Spoon. Don’t forget to enter the giveaway the #BrunchWeek giveaway for a chance to win 1 of 12 prizes from our sponsors! A fun little tea towel I bought while on vacation in Savannah. – Combine first 4 ingredients into the bowl of your stand mixer. Using the paddle attachment, on a low speed, mix the ingredients until the Butter becomes pea-sized and the mixture feels somewhat like sand. – Add the Eggs, one at a time, and mix until combined. This can be a sticky dough. – Once mixed, enclose the dough on plastic wrap, shaping it into a rough circle, and let it rest in the refrigerator for at least 2 hours. – 1/2 Tart Dough Recipe – I usually make the full recipe then freeze whatever I don’t use. 2. Whisk the Eggs together in a medium bowl. Using a spatula or spoon, mix in the Brown Sugar, Molasses, Corn Syrup, Salt, Vanilla Bean Paste and Whiskey. 3. Stir in the melted Butter and Walnuts. Remove tart from the refrigerator, place on a sheet pan with sides and fill to the top, with the mixture. 4. Bake for 30-35 minutes, or until the filling is firmly set. Let the tart cool completely before unmolding. 5. 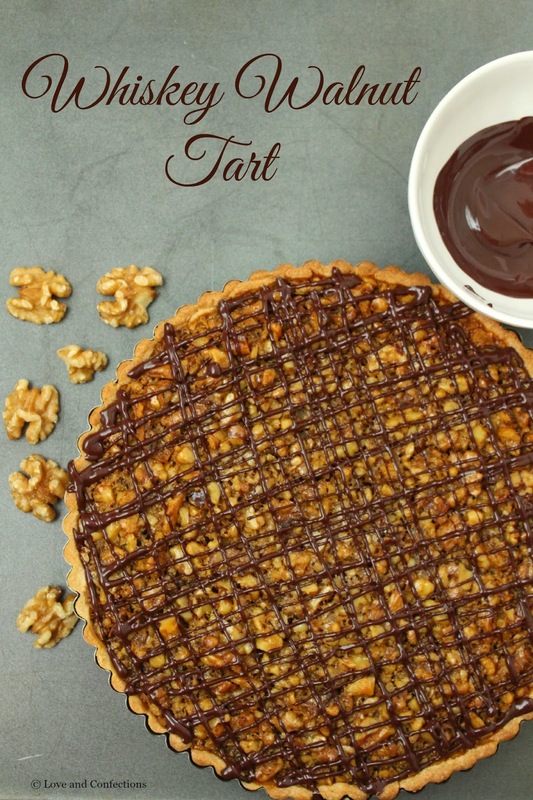 Once cool, place tart on serving dish and drizzle with melted chocolate. Enjoy! Take a look at what the #BrunchWeek Bloggers are cooking up today! Build Your Own Benedicts from A Day in the Life on the Farm. Ham, Asparagus and Goat Cheese Egg Muffin Cups from Cupcakes & Kale Chips. Donut Holes with a Trio of Dipping Sauces from The Redhead Baker. Trail Mix Granola from Making Miracles. Bananas Foster Baked Oatmeal from The Suburban Soapbox. Vegetarian Breakfast Enchiladas from The Spiffy Cookie. Caramelized Onion and Sweet Potato Hash from Take A Bite Out Of Boca. Oat-Chata from Culinary Adventures with Camilla. Asparagus and Heirloom Carrots Salad from Jane’s Adventures in Dinner. Roasted Grape & Bleu Cheese Bruschetta from Bread Booze Bacon. Papas con Chorizo from Sew You Think You Can Cook. 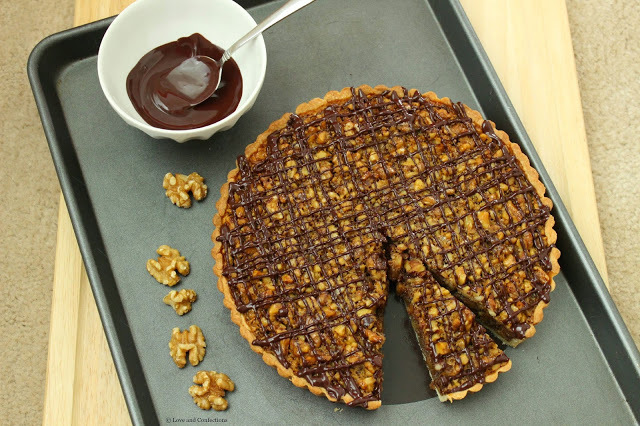 Whiskey Walnut Tart from Love and Confections. Thank you June! It was delicious! It looks GORGEOUS and sounds absolutely delicious. I'm with you on the chocolate and booze being dessert perfection! Oh my gosh I am in love with this tart! Terri, that looks amazing! Thanks for sharing. Looks like I've found what I'm making for Father's Day!